Good evening Rioters! My deepest apologies for the delay in putting up a new book review but tonight I have one I'm delighted to share with you. As of May 2015 Red Wheel/Weiser Books has released Brigid by first time author Courtney Weber. The book focuses on various portrayals of the goddess Brigid throughout history, from Christian saint to Caribbean Voodoo deity, all the while interspersing the mythology with personal anecdotes and opinions. Think Eat, Pray, Love meets Mists of Avalon. 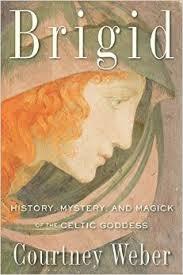 This engaging book sets out to discuss the question: Who is Brigid? What follows are various myths and folktales that all in some way tie back to Brigid through name, association, symbolism, and history. As someone who has not spent much time working with Brigid or reading her stories I was delighted with the assortment of tales found in Weber's book. Both the stories and historical snippets were well rendered. The one main thing that did detract a bit from the overall enjoyment of the book were the italicized reflections at the end of each tale. Though not terrible they felt a bit like a parent asking you for the morale of the story you just enjoyed. I admit this may be entirely personal preference but I could have done without these. Aside from the mythology, the other strongest element in the book was the personal point of view. Instead of a dry text about the history and significance of the deity as told by an omniscient author, Weber offers you the chance to experience Brigid in all her forms through the eyes of one of her devotees. I found most of the personal anecdotes to be honest and entertaining, Weber's pleasant narration leading me further in to the book. Even though Brigid as a goddess has never drawn me to work with her, through Weber I felt the emotion of connecting to a deity and how that impacted her life. Honestly this is one of the better Pagan books I've read from a main Pagan Publisher and I hope to see more of this ilk. Who is this book for? Those who work with Brigid (obviously), anyone looking for a personal account of Pagan worship, and anyone interested in mythology and folklore. PS! Check out Vinna's most recent podcast interview with Mogg Morgan of Mandrake of Oxford publishing! One clarification though, likely more needed to give to the author: Brigid and the lwa Maman Brigit are not connected in any way. Oops, forgot to add name. This book is a good read with lots of insight into this well known Goddess/Saint. There are little projects after each chapter that you can do. This is by my bed for reading anytime I want to reference something. I thoroughly enjoyed this book. It recounts Brigid's history and mythology. It lists flowers, plants, and herbs that are sacred to her, among other things. It even contains spells and is very well-written. If you love Brigid, you'll love this book.